Going back centuries, Austria has been a center for musical exceptionalism. This rich heritage includes composers such as Franz Schubert from the late Classical and early Romantic eras and Arnold Schoenberg from the expressionist movement who invented the twelve-tone technique and staked a huge claim on modern music with forays into atonality and developing variation. In regard to Metal, the country’s offerings are no less significant with bands such as the seminal Death Metal group Pungent Stench, primitive Black Metal warriors Abigor, and fantasy-obsessed Atmospheric Black Metal vanguards, Summoning. The excitement stretches to Post Black Metal duo Harakiri For the Sky whose album Arson was one of this year’s best. The subject at hand is centered on a band called Karg (the German word for barren) that is comprised of half of Harakiri For the Sky, one V. Wahntraum who performs all instruments and handles the vocals. 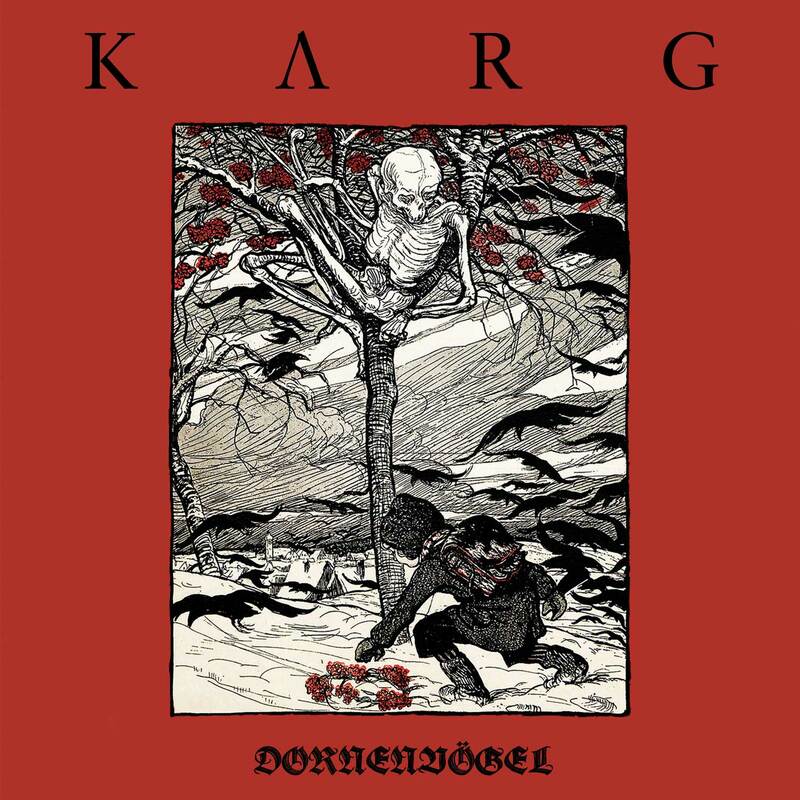 Karg is not too distant from his other project yet it still retains its own unique atmospheric vibe. This project is a prime example of the new paradigm in Black Metal, expansive sounds evoking particular colors or shades of feeling and emotion, mood, and intent. The ethereal and esoteric are welcome additions to the genre’s cannon. “Drangsal” serves as a proper introduction to Dornenvögel. Beginning with lush clean guitar motifs, the music then shifts to a much more straight-forward Black Metal approach. The song is like a self-replicating virus that begins small and soon overtakes one’s mind. This is accomplished by the constant clean, echoing guitar that resides over the rest of the song like notes floating in zero gravity, hanging in the air as a constant reminder of the gorgeous melody upon which the song is based. The third track, “Petrichor,” leads the listener down a storied path, up hills and down through valleys. The unique vibe is attained by an airy mix of multiple guitar parts that when stacked, serve to accentuate the larger melodic idea. When the distortion kicks in, it is that much more abrasive. The vocals are full of primal urges, deep longing, and profound fluctuations of emotion. Occasionally, the music delves into the territory marked by Opeth’s masterpiece, Morningrise. This comparison, though, is more involving the way the song is arranged with myriad ideas rather than actually sounding like Opeth themselves. “Meine Freiheit war ihr Tod,” the fifth track flows down the stream similarly to other tracks yet contains some features all its own. There is a relentless aggression permeating throughout. The riffs and vocals reflect this. Furthermore, there is the inclusion of mesmerizing clean vocals. The result yielded a haunting effect that could really have been used less sparingly to the advantage of the music. The seventh track, “Heimat bist du tiefster Winter,” contains a powerful riff as its basis. Upon this foundation are laid a plethora of swirling melodies. Toward the halfway mark, the gats are dashed open, the temple curtain is torn, and Black Metal fury is unleashed replete with blasting and furiously-performed riffs. As is broadly evidenced across the history of Rock and Metal, solo ventures are usually hit or miss. Perhaps the lack of other band members with vested interests and unique personal opinions as soundboards could be the cause of such inconsistency. In light of this, Karg is all the more impressive because the album sounds like it was performed by a band. Wahntraum climbed a peak considered dauntless and even insurmountable by other musicians in that every instrument is performed with equal attention and care. In other words, the bass parts sound like they were played by a bassist and the drums are hit like a seasoned percussionist. The vocals are not any different from his work with Harakiri For the Sky, mostly harsh, even tortured-sounding at times, a stark contrast to many of the serene, peaceful clean guitars. If this album had to be categorized, it would certainly be labeled as Atmospheric Black Metal. It would be most fitting to have “atmospheric” written in all caps. Listening to this album puts one in a certain mood and the whole process could be likened to taking a trip, a voyage into the depths of imagination. The genius behind the music is the juxtaposition of contrasting parts such as the clean guitar over Black Metal riffs and bitingly caustic vocals. It shows there is beauty in darkness, hope in sorrow, and catharsis in exorcizing demons. Ultimately, this album succeeds both in conveying genuine emotion and in leading one’s thoughts into an altered consciousness. Austria is no less an epicenter for cultural pioneers and leaders of poignant artistry than it was centuries ago.